Reading by the author and a yoga demonstration will also commence. 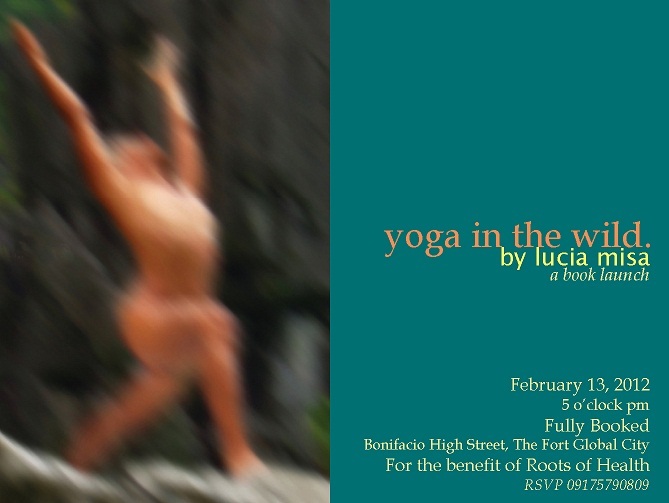 Through the re-launch of Lucia Misa’s book, Yoga in the Wild. The author’s free spirit, fascinating stories of her adventures around the world, and her passion for yoga as a healing process will surely entice both the young and old readers in the metro today. This is a non-profit project, with the book’s proceeds going to Roots of Health, an organization that advocates to improve the reproductive health and overall well-being of women and girls, and to decrease malnutrition in babies and young children within community groups in Palawan. Through this partnership, we will be able to reach our intended market together in order to provide a new education about wellness and most importantly, to help out our less fortunate sisters.